Today I’ve have someone really special on the show, Chris Boerner. Now I met Chris at the Ecommerce Fuel conference in Savannah Georgia a month ago and I’m really glad that we met. She has an amazing story and she runs a successful business called CieloPillHolders.com where she sells premium key chain pill fobs. She’s done exceptionally well on Amazon, is extremely well connected with the Amazon community and she has a lot of experience with the platform. In fact, she’s been featured in several videos on the Amazon website including a full blown documentary about her story. Enjoy the episode. How Chris got into ecommerce and what made her decide to sell pill holders. How she gets her pill holders manufactured. Steve: You are listening to the My Wife Quit her Job Podcast, the place where I bring on successful bootstrapped business owners and delve deeply into what strategies are working and what strategies are not with their businesses. Today I have the Chris Boerner with me on the show, who has made a killing selling high end pill holders on Amazon. It’s a super random product and the reason why I’m having her on the show is to talk about Amazon exclusives, and how she’s managed to create all of these amazing connections within Amazon while launching a successful product made in the USA. Also I want to apologize upfront for the audio quality on this one. I ended up upgrading Skype just before the call which was a huge mistake. The audio is still passable but if it bothers you, you can always find the transcript on my site at mywifequitherjob.com. Anyway before we begin I want to give a quick shout out to Klaviyo who is a sponsor of the show. Now I’m always excited to talk about Klaviyo because they are the email marketing platform that I personally use for my ecommerce store, and I depend on Klaviyo for over 20% of my revenues. Now you’re probably wondering why Klaviyo and not another provider. Klaviyo is the only email platform out there that is specifically built for ecommerce stores, and here’s why it is so powerful. Klaviyo can track every single customer who has shopped in your store and exactly what they bought which makes it extremely powerful. So let’s say I want to send an email to everyone who purchased a blue handkerchief in the last week, piece of cake. Let’s say I want to set up a special autoresponder sequence to my customers depending on what they purchased, easy peasy, and there’s full revenue tracking on every single email. Klaviyo is the most powerful email platform that I’ve ever used and you can try them for free at mywifequitherjob.com/Klaviyo, once again that’s mywifequitherjob.com/Klaviyo. I also want to give a quick shout out to Privy who is also a sponsor of the show. Now what’s cool is I also use and rely on Privy for both my blog and my online store. Now what does Privy do? Privy is an email list growth platform, and they actually manage all of my email capture forms, and in fact I use Privy hand in hand with Klaviyo. Now there is a bunch of companies out there that will manage your email capture forms, but here is why I like and chose Privy. Privy is easily the most powerful platform that I’ve ever used, and you can trigger sign up forms based on any primer that you desire. So for example let’s say you offer free shipping for orders over 100 bucks on your store, well you can tell Privy to flash a popup when the customer has $90 in their shopping cart to urge them to insert one more item. Here’s another cool use case, if someone has item A in their shopping cart, I can easily tell Privy to display a special coupon code for that item or to display a related item or offer. In terms of email capture, I’m showing different email lead magnets depending on what product a customer is browsing on our shop. So bottom line Privy allows me to turn visitors into email subscribers, which I then feed to Klaviyo to close the sale. So head on over to Privy.com/steve and try it for free, and if you decide that you need the more advanced features, use coupon code MWQHJ for 15% off. Once again that’s privy.com, P-R-I-V-Y.com/steve, now on to the show. Steve: Welcome to the My Wife Quit Her Job Podcast, today I have someone really special on the show, Chris Boerner. Now I met Chris at Ecommerce Fuel conference in Savannah, Georgia about a month ago and I’m really glad that we met. She’s got an amazing story and she runs a successful business called cielopillholders.com where she sells premium key chain pill fobs. She’s done exceptionally well on Amazon, she’s extremely well connected with the Amazon community and she has a lot of experience with the platform. In fact she’s been featured in several videos on the Amazon website including a full blown documentary about her story that is going to come out later this year. And with that welcome to the show Chris, how are you doing today? Chris: I’m doing so great, thanks for having me Steve; I’m excited to be here. Steve: Yeah and you got a great story, so I want you to definitely tell us how did you get into ecommerce and what made you decide to sell pill holders? Chris: It’s so random, when I tell people I sell pill holders I get these looks like they just don’t have a clue what I’m talking about and I can understand why. My background is in corporate strategy and brand management. Steve: What didn’t feel right about it, I’m just curious because I just quit myself? Chris: Oh my gosh, congratulations. I was feeling like I wasn’t making a difference in a way that was meaningful to me, that was probably the biggest part and so when I left I actually didn’t know what I was going to do next. My husband Mike is incredibly supportive and let me leave a really great job so that I can have some breathing room to just try to figure out what it was going to be. When I talked about my job at Starbucks to him, I described it as dead, every minute was just jam packed with information and intensity and I needed to just get away from that just to even have a minute to think about what I could do and what I could be excited about, because I wasn’t feeling very excited anymore. So I left, I was up to two things. I wanted more flexibility in my life, we were down the road going to have a family and now we do with two very little kids and I knew that that was hopefully going to happen someday and so I want more flexibility, and I wanted to connect with people and I wanted to connect with customers in a way that I had when I was a barrister at Starbucks. I used to be that person handing over the coffee and I loved that moment when I got to say have a good day and make someone smile, and so I really missed that connection. I laugh a little bit when I say it but it’s kind of true, I felt a power point presentations away from the customer at Starbucks, So then I left, to more flexibility and connecting with customer and no idea what that actually meant. Steve: So in terms of coming up with the actual idea for pill holders, how did that come about because it is like a random product to someone who just hears about it, right? Chris: Yeah it’s very random, so I started like many of your listeners I would guess, I read the 4-Hour Work Week and the idea of automation really resonated with me and so it sounded kind of like something I wanted to try. I had a lot of experience with business and with building brands, and I thought, uh I could do this, but what’s the thing, I don’t have anything to sell. So literally one day I was lying in bed a couple of days after I read this book and I was racking my brain and I started thinking about what consumer goods am I part of, what products do I use in my life, and you know what’s really different from everyone else brand. So I was diagnosed with an autoimmune condition called [inaudible 00:07:14] when I was 14 years old, and I’ve taken medicine every couple of hours since I had the diagnosis for 20 years now I’ve been taking medicine. And so I was lying in bed, I started to think about gosh I take pills and I have a pretty nice pill holder that my dad gave me that it’s been a very important part of my life and lying there thinking everyone who takes medicine must have a nice pill holder and they must be a totally developed category. So that next morning thinking that there wasn’t a whole bunch to this idea, but I searched on Amazon and I searched on Google for a nice pill holder, a quality pill holder, a designer pill holder and there was nothing. There was like actual total like based on the category for high end premium pill holders, so I decided to give it a try and here we are a couple of years later. Steve: So you pretty much came up with a product just by brainstorming, did you run the numbers, like was there significant demand for just pill holders, if there was a high end component to it? Chris: Yeah. Well my hypothesis was – so first I started with just pill holder category in general, like it was clear that there is tons of demand for pill holders out there, because there’s 1000 products from the market that are just junk. And I was digging up some keyword searches and quantified that a little bit, and then I really started to think about that culture that we’re living in and how much it’s changing with how pills and perception means you’ve had a life and I don’t just mean prescription or [inaudible 00:08:39]. Chris: I know like this is not coming up quite how I meant it, but anyway seriously who doesn’t have Ibuprofen [inaudible 00:08:50] in their purse or in their pocket, everyone’s got a vitamin or a supplement. And so I started to think about the expectations that consumers have today, and especially if you’ve got 18 baby boomer population that cares about quality and that cares about nice stuff. It blew my mind that there wasn’t a product out there already doing it. So I looked at it pill holders as a functional accessory like jewelry, like watches or eye glasses, that was the vision that I had for Cielo Pill Holders. Steve: Okay and so you basically decided to target the high end, really high quality jewelry like pill holders? Steve: So can you talk about how you went from your idea to actually getting a manufacturer? Chris: Yeah so I was very interested – let me say the most important thing in my brand was quality, and so the way that translated to my product was that I needed to be really, really involved in the manufacturing and the production and the design and ongoing quality control. So from the very beginning I really believed that made in USA was going to be something that mattered to Cielo Pill Holders, and I believed it also mattered to my customers in ways beyond just the quality of the pill holder they were buying from me. So I started out with a belief that made in USA was the direction I wanted to go, and so pretty quickly actually I found on eBay a couple of products that were a little better than what was in the market and they were good enough for me to test the idea that people would pay more for a better quality pill holder. So I bought some pill holders off of eBay, and then I built my own website and I really tested the marketing messages around made in US that are quality and started to see will people buy this product. Steve: How did you do those tests? Chris: I spent about six weeks just building the website and getting some product photography done so that it really was a high quality proposition, and so launched the site and had this great idea that somehow miraculously everyone in the world is going to know that now there are high quality pill holders available and I was going to show out immediately. It turned out I didn’t because nobody cared about Cielo Pill Holders. So it was within the first couple of weeks of launching my business with very little traffic on my own website that I started to realize Amazon or meeting my customers where they were already buying to be a really interesting and quick way to test. So I launched on Amazon within a month of turning on Cielo Pill Holders. Steve: Okay I was just curious, the ones that you bought on eBay were those made in the USA? Chris: They were, yup they were. Steve: Okay and so when you sold those did you contact the same manufacturer who made those, like how did you find the manufacturer? Chris: Again I started out with them, but they didn’t really have the capabilities, the really the partnership mentality that I was looking for, so went to the web and I went to ThomasNet, but I also just did a Google search for high quality machine shops. So I had figured out what type of manufacturing I needed to make my own pill holders, and lo and behold in the Seattle area we had a lot of machine shops because there is a really strong aerospace factory there and machine shops and CMC machines to fly a lot of aerospace parts. So I went to Google and I looked up high quality machine shops, and I found one that actually had a website that was beautiful and that talked about their commitment to the customer and their commitment to quality, and those sentiments were really what I wanted my brand to stand for and so it felt right that I could look for a partner that cared about the same stuff. So I called him up and I remember sitting outside Safeway, the first time I talked to him I was in my car and I told him I wanted to make pill holders, would you be interested, and I’m sure he must have thought I was crazy to the multimillion dollar business since I was [inaudible 00:12:48] and huge companies. But he said yeah I’d be willing to talk to you and I said, great can I come back to meet you tomorrow. I went up to his shop and we sat down and talked about it and I remember when I left after that first meeting he said, I think you’re going to be my biggest customer. Chris: And he believed it, he said I think you’re going to be my biggest customer, he said I totally get it and I want to help you figure it out. From then on he just then became a partner and really figuring out how to build it efficiently and in ways that my customers would love the product. Steve: So you didn’t have any experience with manufacturing at all? Chris: Not directly, from working at Starbucks I had seen manufacturing and I had managed the process of getting things made, but I didn’t know a lot about manufacturing on my own no, ever so much. Steve: So in terms of just like designing the actual pill holder, did you use any card sulphur [ph] or was that all your partner? Chris: He did that for me, so I told him what I wanted and then he designed it, and then I had sort of a few products that I started with, and then my vision really was that there was a really designed for elements to this like jewelry beyond what me or a manufacturer could come up with, and so I engaged a pretty incredible product designer. She, her name is Flora Handler, she’s out of New York and she’s worked with brands like Carrie and Tom Ford and a few great premium brands, and I could not believe it when I called her and she got the concept too and she was really excited to work on the project. Steve: Would you say that people agreed to work on this was because of your story or what did you tell these people? Chris: I think I painted a picture of the opportunity, it was like tens of millions of people take medicine, they have to keep it with them and all there is junk to put it in. So it seemed so clear to me and them as I just told them about it that there was room in the market for this high end product, so they were excited to be part of it. Steve: With your machine shop partner what was the arrangement like early on, like he wasn’t a partner from the beginning? Chris: No he wasn’t but he acted like one. I mean I was really, I was just buying products from him but he spent time with me well beyond what the volume of my orders wanted. I think that he saw the potential of what it could be, and so he and my designer and I actually spent a lot of time working together on my more fashion for design for product. In fact I remember I started the business in June of 2013 and it was August when I started working with Flora Handler my designer. I always remember sitting in my manufacturer’s bed of his pick up track outside of his facility and we had had our stone sitting in the middle of us, and we were on speaker with Laura who is New York and we were starting to talk about the briefs and the project for really making jewelry like pill holders. Steve: What was the initial investment, I’m just curious like when you first got started? Steve: $1000, wow okay and so he was willing to design the pill holder for you at a such a small quantity for you? Chris: He was yup and it’s really fortunate in the manufacturing process that I use because the upside and downside there is not a ton of efficiency that comes from scale, but there is also not a ton in the way of total cost either, it’s all done on computer, you’re not dealing with molds and such. Steve: So is manufacturing a pro – so here is a single individual hand making these? Chris: No, he has a number of machines in his shop and I’ve grown since then in my supply chain, so he has 20 or 30 people who work for him in his shop. Steve: Okay and then you brought on this designer and you just cold called her? Chris: It’s the one connection. I never knew the power of a network until I left the place where I worked at Starbucks. It turned out I knew a lot of people that were excited to help out. Steve: Okay and these were just connections you made through your corporate job? Chris: Yeah that has been pretty valuable in the product. Steve: I know you told me that you decided to go made in the USA right off the bat, but I’m just curious did you do any research on the nature and just to see how much this potential would be. Chris: I did, I definitely did, I wanted some mixture, it was smart business decision besides just a feel good decision, and so I through a different connection had someone was a sourcing agent in China that I worked with to just got quotes to get me a rough ball pack on what I was giving up, and it’s definitely no surprise there is a cost advantage, but I built a model that supported the higher made in US cost. Man I can’t even tell you the value being turntable value that’s brought to me with the flexibility in partnership I have with my supplier and being able to iterate quickly and bringing the products to market fast and deal with quality control right away. I would have lost my mind if I didn’t have someone in the US; I talk to my supplier almost every day. Steve: Just curious percentage wise what are we talking about here? Chris: It’s probably 50% keeper. Chris: No definitely not and even scale as the product is continuing in its life cycle even my top sellers are making refinements along the way, but my manufacturer is really quick to respond to and get what I’m trying to do. Steve: Okay so let’s talk about sales now, so you launched a site, you didn’t get any traffic to it and so you decided to launch on Amazon. How did you actually launch your product on Amazon? Chris: One afternoon right before the 4th of July, I looked up can an individual sell on Amazon and found out that I could and I was sort of shocked by that, and so I went through their seller central support system and I set up my product and I turned it on, and that was the extent of my launch. Chris: Never actually up until the last year I’ve just started doing fancy products I guess in the last year and a half, but no I was pretty naïve, I just turned it on and that was it. And then I went on vacation and found that I was selling some pill holders, this my cool little seller app tells me how I’m doing. Steve: Which I’m sure you were not checking at all on vacation? Chris: No, no definitely and I still don’t check it every ten seconds [inaudible 00:19:42]. My husband and I like to shout out numbers to each other as we get excited, but we were living the dream. Steve: You product just naturally takes off, so how – so just walk me through this, like how did you start getting featured on videos, your documentary and all that stuff, just walk me through that? Steve: Specifically how does a Chinese guy get on a documentary? Chris: Yeah how do we make it happen? So much of it I think is who you know and chance. Well let me just not say who you know, but it’s just like being open to what can happen, I think that’s a better way of saying that. So since I started there’s never a Cielo pill holder, if I listed for you the 28 things that have happened that seemed so coincidental, you would just go there is absolutely no way that, this is not possible. And yet somehow things are suddenly working when you’re on the right path, I really, really, really believe that. Amazon and my partnership with them has been probably one of the biggest examples that the series of so called coincidences like holy crap they just, they work and there has to be, and you look in hindsight and you’re like of course that is the way I went. That was theoretically how the Amazon relationship got as strong as it did for me. I guess I’m naturally a person, I just love to meet people, and I love to connect. The Amazon relationship started for me in the peak section at a Home Depot, because I was going to pick my kitchen and I started talking to a girl there because we both had little tiny babies and we started to chat. She and I hit it off and she said you know I’m having this barbecue; you and your husband should come next weekend. So here is a friend, a person I met at Home Depot and I went to barbecue at her house and she said I want you to meet my friend, he works at Amazon, I think you guys have a lot to talk about. And lo and behold it was his last week there and Amazon had just launched the exclusives program, so this was June of 2015, just a year ago. It was his last week with Amazon and I talked to him and he said, oh my gosh this product, I think it’s just right, let me email my friend who is in charge of the exclusives program, I think you should do it. So that was a Saturday and on Monday I had an email from the head of Amazon exclusives saying, would you like to join our program, and I’d had a conversation with a pretty big buck retailer in order to partner with Amazon and I think I was the 26th brand that they brought into the exclusives program and it’s now into the many hundreds. So that was the fortuitous, random, you can’t meet it at Home Depot that lands me on Amazon. Steve: Lets’ talk about Amazon exclusive, so first of all for the people out there what is it and why did you decide to not go with the big bucks retailer and go with Amazon? 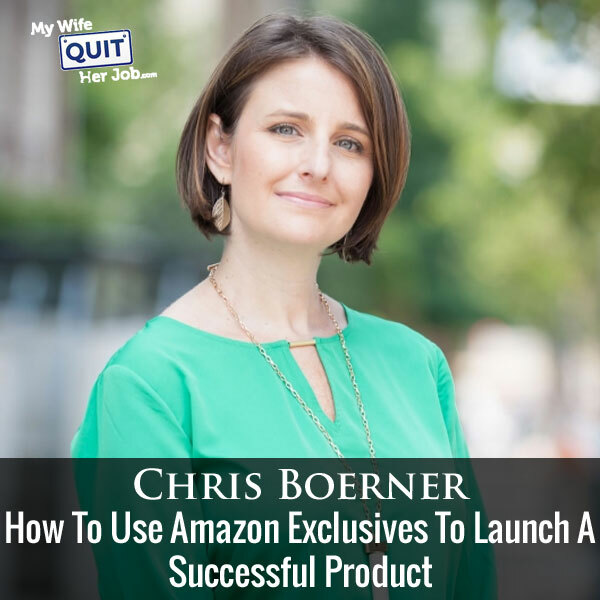 Chris: So Amazon exclusives is awesome, it is perfect if you’re a brand that is really just trying to get off the ground, or if you’re a brand that is bringing a lot of new products to market and wants to get traction fast for them. So the intent behind Amazon exclusives is that Amazon is curating these interesting core products and brands that they can introduce their customers to, and exclusives is actually a store front within Amazon.com, so it’s amazon.com/exclusives. That really show case all of these brands, and so as a business or brand owner what you give them is exclusivity for starting a six months is the initial commitment you make to them where you’re only going to sell on your own website, so that’s okay and you’re going to sell on amazon.com, and you also pay them a little bit more in fees, so a few more points in fees on your product assortment. So what made that worth it to me was the additional marketing and merchandising that they give you, it’s incredible for they’re constantly every month refreshing different collections of products that they are featuring for their community, and so you have a chance every month and I’m sure I was being featured right now as a stock in to [inaudible 00:24:05] for example. Every month your products can be show cased in these different tech gadgets or a gift for him, a gift for her, whatever areas to focus on. Amazon gives it home page extra marketing, there is access to deals which was a lot more valuable but for other lightening deals where [inaudible 00:24:26] you can do deals a lot more if you’re selling through the exclusives team. Steve: Can you do a [inaudible 00:24:31] more of their restrictions. Chris: There are the same restrictions that you have with the frequency of them and so on, but the fees are waived, so now that they started targeting for lightening deals you don’t pay fees on them in the exclusives program, that’s all rolled into what you pay them upfront. They also give you A plus content that you can put on all your product pages, so that’s really a place to show case your brand story, and you can upload videos which isn’t something that just a normal Amazon seller can do. Steve: Can you [inaudible 00:25:02] A plus content just in case someone doesn’t know what that is? Chris: Yeah so A plus content is if you scroll through a product listing down to the bottom of the page, and if you looked at one of mine, my frame single chamber pill holder product is probably a good example of it, it’ll show you where you can just tell, there is like extra space to put a picture, then put up copy and put videos and your logo and really use that space to tell more of a story about your brand so you are not just a picture and a price with a couple of bullets. So it helps people really engage with you beyond just a typical Amazon experience. Steve: I just want to take a moment to thank ReferralCandy for being a sponsor of the show. Now for any ecommerce store word of mouth is huge, and when a customer is super happy with their purchase they will tell all of their friends. Now what if there was a way to amplify word of mouth about your company, what if there was a way to reward referrals for your business? This is where ReferralCandy shines, with just a couple of clicks of the mouse you could add a referral program to your ecommerce store and reward your customers for telling their friends about your shop. Just curious, what is the conversion rate increase from having that A plus content versus not having it? Chris: I wish I knew, there are so many variables that have changed over time that I don’t actually have a good answer to that. I believe it works though. Chris: I sure want to know. Steve: I’m sure a lot of people have been curious how some of these listings are so full whereas other listings are just like flat out text, so this is how you do it. Chris: That’s exactly how you do it, and if you’re not privy to this program I think through AMS you can buy, there is a way you can pay for that extra content if you’re not part of exclusive. Steve: Right it’s like thousands of dollars I think, right? Chris: Yes it is, it’s thousands of dollars, yes so and then so many other things that come that are less concrete I guess but can just happen because of the visibility you have on the exclusives platform is PR opportunities. So the Amazon PR team is really interested in what’s going on with third party sellers, and what a third party seller which now make up half of Amazon sales. The third party sellers with some of the most visibility are on the exclusives program and so when they get a pitch from a reporter or they’re pitched in a story and want to illustrate it with follow up commentary, they call up sellers from the exclusives program. So I think I’ve had some pretty unusual results but I’ve been featured in Forbes, Small Business Journal put in an article about Cielo this week, been on the front page of the Seattle Times. I was in an Amazon fulfillment center on Cyber Monday last year which was awesome, and I ended up in 13 local news segments that day, incredible. Chris: Sales, yes, yes, yes and then they just keep growing. Steve: So which press release actually had the largest effect, was it your magazine mentions, your newspaper mentions? Chris: It was the newspaper, so actually it was the local TV where I was able to talk about the product by far, and so I think there a whole bunch of factors that go into that was also Cyber Monday. So people were in a gifting share mind and my product was being featured as a highly giftable stock in [inaudible 00:29:23] item. But I think – go ahead. Chris: Oh no, no and in fact I should also mention that when you submit your products every month for consideration for different marketing opportunities, the Amazon exclusives team is taking that internally and they are looking at what are the broader promotions within Amazon that are going on, and can we take Cielo pill holders for example and promote them more broadly on Amazon. So last year they did 12 days of gifting promotion, Amazon exclusives did and they were able to promote that on amazon.com mobile home page, so Cielo had a day last year and Cielo was on amazon.com’s mobile home page. Steve: Like the front page? Chris: Yeah like I just drove down, aha once you got to the 12 days of gifting pack it was insane, it was awesome. Steve: Okay, all right so anything you left out about this awesome exclusives program, it sounds incredible? My next question would be naturally how you get in? Chris: So the way you get in is pretty easy actually, they have an application process right on their exclusives home page, so amazon.com/exclusives and you can get in right there. I also, I know a bunch of people and I’m always excited to talk to new entrepreneurs and people too, so feel free to send me an email if you have any questions about it. Steve: Are they really restrictive on who they let in, like I would imagine like you are special because you have this really awesome story and then your product really ties into your background. Is that what they look for or do they just accept a lot of people? Chris: I think it’s kind of a mix, they are looking for great stories to tell and that is their top priority is to bring really great products and with stories behind them to their customers, and I think they’re trying to balance that with how they also grow the program quickly and maintain the integrity of it. Steve: Okay and then so today how many people are in the exclusives program, do you happen to know? Chris: I actually don’t know, it was a few hundred a few months ago I think. Steve: Which clearly means that they have a very exclusive criteria to select who they want? Steve: What would you say – sorry go on. Chris: I’ll just add one more thing. One really great benefit has been that I have been invited to strategic seller conferences which clearly I would never be part of as just little tiny Cielo Pill Holders without a connection to exclusives. So exclusives often gets to invite some of its sellers to the bigger top seller conferences that Amazon hosts, so I’ve been there with top, top Amazon sellers and learnt so much from people in Amazon. Chris: Nothing specific comes to mind right now, I’m sorry. Steve: It’s okay. Well let me ask you this, what would you say are some disadvantages of doing the exclusives program? Chris: Well I think that there is a right time in a brands life for the exclusives program, so I think it’s really, really great as you’re just starting to grow. I talked with some people who are close to the program and the idea isn’t that you’re in the exclusives program forever, eventually you should outgrow it. So I think that I’m at the point right now where I’m starting to think about what’s the right distribution strategy for, me and is it staying exclusive with Amazon forever, probably not. And so I think figuring out the right timing in your life cycle is probably a really important thing to consider. Steve: So for a launch vehicle, that’s generally when you recommend getting in? Chris: Yeah I think it’s great for a launch especially now that incentivized reviews have gone away, because I didn’t mention one other part of the program is they’re constantly featuring new products, and there’s a whole new “Look what’s new” in exclusives section. So every time you add a new product, you are automatically on the feet to get show cased there, so you’re getting extra visibility for new products. Then this is also a group where they are beta testing a lot of the new Amazon programs, and so I know there has been a lot of talk about what are they going to do with the early reviewer program, and I think that with probably some of the exclusives people are getting the chance to try out before maybe the general seller population. Steve: I see, so I would imagine as part of the exclusives program, you really don’t need to do much marketing it sounds like, right? Steve: Like giveaways, even sponsored ads, you mentioned you’ve just started buying them? from the exclusives program that’s just getting you going even faster, and then from there sponsored products and whatever extra marketing you do and giveaways and all of that just rumps up that fly wheel even faster, that’s the word they use all the time internally, the fly wheel. Steve: When you launch a new product then, do you still just list it or do you do anything special? Chris: I have been a little bit lazy because of – I’m going to blaming it on having two babies these last two years, but mostly I just listed, and I probably could be doing a heck of a lot more. Steve: Okay, another question I want to ask and it might be obvious but do you make the majority of your sales on Amazon, like is your site generating sales right now? Chris: The majority of my sales probably 85% are on Amazon. Steve: Okay and here’s a question I want to ask you, because you’re part of the exclusives program and you have some internal contacts over there, do you feel a lot more secure putting more of your eggs in Amazon’s basket, like are you immune to like the copy cats and getting your listings suspended and that sort of thing? Chris: No, I’m not immune to it. I have advocates to help me through when it happens and it has happened, it happened recently and even with really great advocacy and great connections it’s not an overnight step even for me and so that actually scares the heck out of me, so what would it be like if I didn’t have those connections. And so I’ve seen competition has increased significantly in the pill holder category including the cost to buy product over the last six months or so, and so that’s actually a big part of what really pushed me to think about diversification as well. Steve: Do you think that has anything to do with being a part of the exclusives program, or do you think it’s just people using Jungle Scout and finding your product? Chris: I think it’s probably more just the Jungle Scout stuff, because it’s Chinese knock offs. Steve: So let me ask you this, they can probably undercut you on price, and they are probably not domestically realistic, right? Chris: No and that’s another thing that they’re really good about in the exclusives program is obviously you’re part of brand registry, but if anyone hijacks your listing they’ll take it down immediately, you just have to email and tell them it’s gone. Steve: Okay, so we’re talking about copy cats right now that have separate listings, right? Steve: So let me ask you this, a lot of sales have to do with price, so how are you emphasizing your listing and still making sales even though your product might be like 30 or 40% more expensive? Chris: I rely a lot on my imagery to communicate quality and that’s probably besides price the second biggest thing you’ve got there, and so I’m nervous about it to be totally honest, and I’m thinking a lot about innovation and patentable innovation as where I can get my sustainable growth from. The rip off from my core products have been pretty intense. Chris: Oh they look identical, in fact they look so identical that they steal my images and my bullets and I’m still working on getting those taken down. Steve: That’s terrible, that’s terrible. Chris: And the quality is actually pretty good too which is the worst part in my mind. Steve: Oh my gosh, okay. So you mentioned wanting to go beyond the exclusives program, have you considered going into like retail outlets then, other retail outlets? makes a lot of sense for Cielo, and so that’s an area that I’m very interested in learning more about, but I do think there could be a really strong wholesale business and that’s probably my next attraction. Steve: One thing I did want to talk to you about as well is you’ve kind of created this philanthropic community around your product as well, how has that contributed to sales and what has that done for your business? Chris: It’s been awesome. I mean it’s a pill holder but it’s a lot more than that in my mind, and what I mean by that is health is so personal, and matters so much, and so I hope these pill holders are creating an experience for people that’s better than anything else they’ve experienced with pill holders out there. It’s coming to people who have – they have chronic conditions and being sick isn’t the best part of their lives, and I want to help them make it better. So beyond just the product, I wanted to create a business that mattered and actually helps people, and so I with my autoimmune condition I still pin it back to that with the way I try to really make a difference in terms of choosing, make a difference that is true. I partnered with this incredible organization, generally a research institute, I couldn’t believe it when I found out they were in Seattle. I was looking at campaigns all around the world that I could work with and they happened to be in my own backyard quite literally, and so they are a leader in global autoimmune disease research and I have been so fortunate to work with them. I’ve been through their facilities and worked with their scientists and spoke at their events and I give money to them, but more than that I’ve just connected with them and they’ve connected me to their patients, and I’ve just met some wonderful people and I know it’s actually making a difference for them. Steve: So in terms of this, is this something that’s prominent on your Amazon listing as well that you give money to this organization? Chris: It is, yeah it’s one of my bullets on the key, my five bullets and then it’s also in my A plus content. Steve: Okay and so that probably all ties in, like that value prop is probably pretty strong that someone may want to pay the extra money for? Chris: That’s the hope, made in the USA, philanthropic, beautiful and of course great quality. sales in your own website? Chris: I’m actually really focused on building an ecommerce business through my own site. It’s funny; you know we met at an Ecommerce Fuel event a couple of weeks ago. I felt like such a novice there because I’ve a great Amazon business, but I feel like I don’t have a clue about building my own website. So one of my strategic task for this coming year is really to build a strong ecommerce business off of the Amazon, so I’m actually right now migrating off of exclusives on to Shopify so that I have an introduction platform in place that can help with that, and then I really think Facebook ads are going to be a place that I can find the right customers to a pretty specific niche product. Chris: So once I get the migration done I’m going to focus on Facebook and I think I’m going to focus on really specific groups like I have products geared for people who have had heart attacks. So that’s a really narrow group and I’ll probably try to find them on Facebook and they’ll be some of my testing. Steve: Okay and then what were some of your key takeaways, like what are your top three things that you’re going to do to take yourself off of Amazon and establish your business, so you mentioned Facebook ads, what else? Chris: Well I’ll take diversification with the hotel platform is probably the biggest number two, number one for me, so looking at hotel opportunities, number two building my site through Facebook ads, and also I think this is equally as big but a little bit longer term play is this product is something that I can mention is personal, it’s about health and I have done nothing to really raise awareness and promote it and create advocates in the community of people who have chronic conditions, so huge plans for outreach and advocacy to really start to create loyal brand followers. Recently I was combing Amazon data, it’s 15% repeat customers, and that’s just off of Amazon from people who like the product. So imagine if I can get people that actually know the whole story to start to talk about it and care about it, I think the opportunity is huge. Steve: That will be cool. One thing I did want to ask you, you mentioned you wanted to branch out into wholesale, that implies that you’re going to be off the exclusives program, right? Chris: If I go that route, I think that that’s a someday thing, it’s not an immediate thing, so this is more like my long term strategic plan. Steve: Okay and then in terms of this document that’s coming out, first of what is that coming out and is it going to be like plastered all over the Amazon website? Chris: I don’t know, that’s such a great question. So Amazon, they’ve just been really excited about my story, I don’t remember if I told you this or not but I’m actually in an ad campaign for Amazon right now in Europe. I think I’m on the side of a bus and maybe some bill board. Steve: Oh my gosh, that’s crazy. Chris: They did a photo shoot at my house and I got some great images I get to use, but they did do this video which was not – we filmed it actually a year ago almost to the day, I can’t believe it and we shot six locations, inside my manufacturer’s, inside my high school, kind of like the life story of Chris Boerner that culminates in hero. I don’t know exactly what they’re going to do with it, I got an update recently that it’s very much still under way and they’re getting close to wrapping it. So I know they’ve invested a lot of time in it and they want to really show case to really tell a story, so my guess is they’re going to promote it maybe someday I’ll be on the Amazon home page, I’d be all right with that. Chris: You can send me an email, chris@cielopillholders.com. Thank you so much Steve. Hope you enjoyed that episode. Chris has an amazing story and it also goes to show that you don’t necessary have to be importing your goods from China in order to succeed with good margins. For more information about this episode, go to mywifequitherjob.com/episode153. And once again I want to thank privy.com for sponsoring this episode. Privy is the email capture provider that I personally use to turn visitors into email subscribers, therefore email capture, exit intent, and site targeting tools to make it supper simple as well. I like Privy because it is so powerful and you can basically trigger custom pop ups for any primer that is closely tied to your ecommerce store. So if you want to give it a try it’s free, so head on over to privy.com/steve, that’s spelled P-R-I-V-Y.com/steve. I also want to thank Klaviyo which is my email marketing platform of choice for ecommerce merchants. You can easily put together automated flows like an abandoned cart sequence, a post purchase flow, a win back campaign, basically all these sequences that will make you money on auto pilot. So head on over to mywifequitherjob.com/Klaviyo, that’s spelled K-L-A-V-I-Y-O, and once again that’s mywifequitherjob.com/Klaviyo. I also talk about how I use these tools on my blog, and if you’re interested in starting your own ecommerce store, head on over to mywifequitherjob.com and sign up for my free six day mini course. Just type in your email and I’ll send you the course right away via email, thanks for listening.